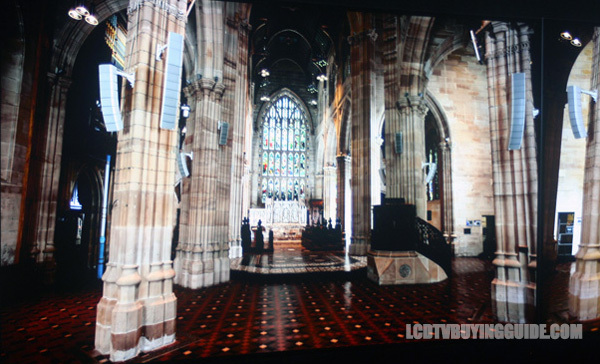 The UJ7700 is really the entry model into the high end of the LED-LCD TVs offered by LG. You get most of the best features including the new Web OS3.5 system, 4K, a wide color gamut, and the magic remote. One downgrade is less audio system power at 20W rather than 40W on the two higher end models models. There is no more important component of a 4K UHD TV than the video engine – particularly the ability to upscale/upconvert resolution to the native resolution of the panel. LG's UJ7700 does a very nice job in this regard, and with much improvement over last year's models. Processing artifacts are cleaned up nicely. The lack of 4K content is going to continue well into the future, so stellar upconverting all manner of HD resolutions 720p, 1080p, 480p is essential. The higher up the HD chain you go, the better the clarity and detail to show off the native 4K resolution. This Video engine and upscaler quality is also one of the differentiating factors moving up the price scale between models within LG. The UJ7700 uses a 4 step process to examine and enhance broadcasts, recorded video, and home video game consoles. LG's UJ7700 uses an IPS (in-plane-switching) panel, albeit a new one for 2017/2018. The IPS panel allows for much better picture quality from side angles without degrading color saturation and contrast much. This is one of the standout features of this TVs picture quality. There are still weaknesses in both with side angle viewing as contrast degrades, but generally the IPS panel is 20%-30% better from angles than non-IPS panel LED TVs. Reflections are also subdued by the IPS panel and front substrate. Colors do to render more depth and slightly better saturation in these new 4K HDR models. The UJ7700 has an expanded color gamut meeting HDR standards. LG contends this is due to their new Color Prime technology-which uses phosphor (colored) based LED lighting. Out of the box colors are over saturated but after calibrating the picture settings or using the cinema (user) setting with contrast at around 80% you get natural, crisp colors. Black levels are hurt by the IPS panel. In a dark room environment, you will notice that they are not pitch black. This is a drawback of the IPS panel – a trade-off for the better side angle viewing. The big focus TV feature for 2017/2018 is HDR (High Dynamic Range). HDR extends the range that a pixel in an LCD TV can show. This applies to the brightness and luminosity of images. Contrast is enhanced by increased brightness rather than deeper blacks. Rather than just increase the brightness of the picture overall though, the real purpose of HDR is to increase contrast in various image areas of the picture. It improves the presentation in the brighter parts of the picture and this creates more contrast with surrounding darker parts of the picture. Since picture contrast is one of the primary features in improving perceived depth, HDR is considered a major picture quality improvement even though it may not increase the overall contrast of the panel a lot. Bright colors receive enhanced purity. A good HDR image will show better shadow detail, and the scenes that you will notice the most are those with light illuminating images, such as a room that has sunlight coming in through a window and illuminating parts of the room. HDR content is and will be in short supply for a while. The studios, distributors (Netflix, Amazon) and TV manufacturer must all be on the same page for you to see HDR content. Some Amazon Original series are currently offered. Vudu currently offers 30+ Dolby Vision titles. Dolby Vision is HDR plus wide color gamut. The same IPS panel that causes the UJ7700 to excel from side angles performs in mediocrity in black level depth and contrast. IPS panels are especially good at side angle viewing capability, but take away from black levels. So if you are a night time, center view, movie watcher this may not be the best TV for you. The local dimming feature may be turned on or off and affects contrast a good deal. It's adjustable in High, Medium or Low setting and you will notice the picture darkening progressively from low to high when using the feature. It does not really enhance picture quality much and we recommend the low or medium setting if you are going to use the feature at all. The TruMotion feature setting is used for judder reduction. Our recommendation is to turn the TruMotion settings feature off with all but sports programming. It adds that kitschy fake look to the picture by removing too much of the intended background blur. One of our readers called it the “Telenovela” effect to give you some perspective. It's especially distracting during BluRay movies. It may sharpen older DVDs and give you a new perspective on them. The UJ7700 does a nice job of eliminating judder in most content even with the Trumotion setting turned off. Streaming movies and older DVDs may show some, especially in scenes that pan slowly side to side. The UJ7700 has no problem with fast motion video scenes due in part to it's 120Hz panel. LG's LED-LCD TVs are very easy to set up a great warm picture quality. The settings below get you very close to D65 without having to worry about a 10-point white balance adjustment. Obviously, if you are in a brightly lit room, try the Expert Bright Room Setting instead or just ramp up the backlight setting. The primary improvements over last years excellent WebOS 3.0 are cybersecurity assurance program certification, a better or at least different zoom function which allows the user to zoom in on various areas of the picture. You will literally know more than the game day announcers in the review box – for better or for worse. 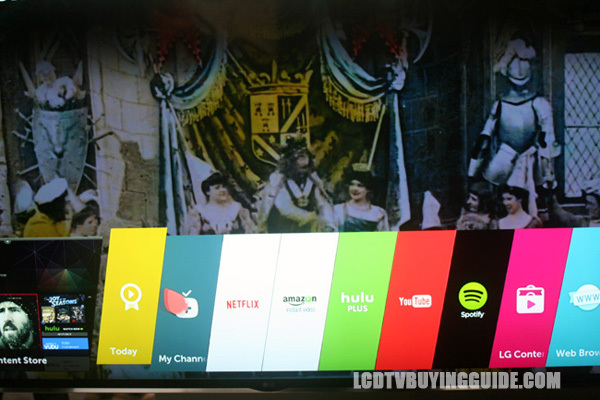 Also, what we found interesting was the ability to connect our mobile devices to the TV and view content on the TV, especially pictures or videos. There are new “hot” buttons for connecting directly to Netflix and Amazon with a press of a button. Boot up times are fast, and this is either the best or one of the best Smart TV systems out there now in terms of speed, and user interface. The interface layout is straightforward and intuitive and makes sorting your favorite programs very easy with the point and click operation of the new LG Magic Remote (we love the Magic Remote). The ability of the user to order and place the various Apps that matter most is a considerable strength over competing systems. Overall, WebOS provides a smooth, and very enjoyable experience. The one knock is that Samsung's Tizen, Android and Roku do offer more Apps selection, although LG will have nearly all of the major Apps that are considered important. Smart TV options are Netflix, Amazon, YouTube, HSN, Showtime, Drama Fever, iHeart Radio, and newly DirecTV to name a few. WebOS 3.5 makes it very easy to choose your apps without leaving what you are currently watching. 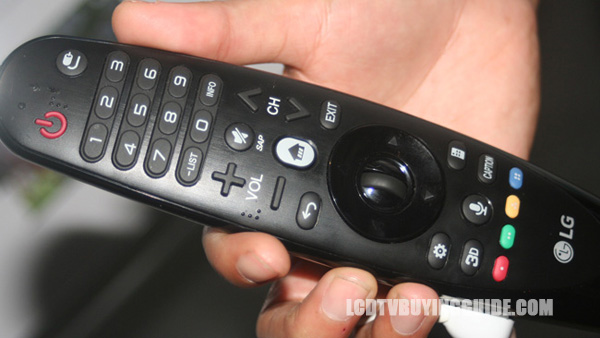 The point and click navigation on the new LG Magic Remote works as fast and seamless as ever. It's the best remote in the market. Simple is the name of the game here. Instead of a home screen with tons of buttons, you get a nice colored strip across the bottom of the screen populated with your favorite apps and the LG store. What you are currently viewing stays on the screen. Click the left arrow on the screen to see your open apps and the right arrow to show all the app downloaded to your TV. We are impressed with the speed of switching between apps. It is instantaneous. 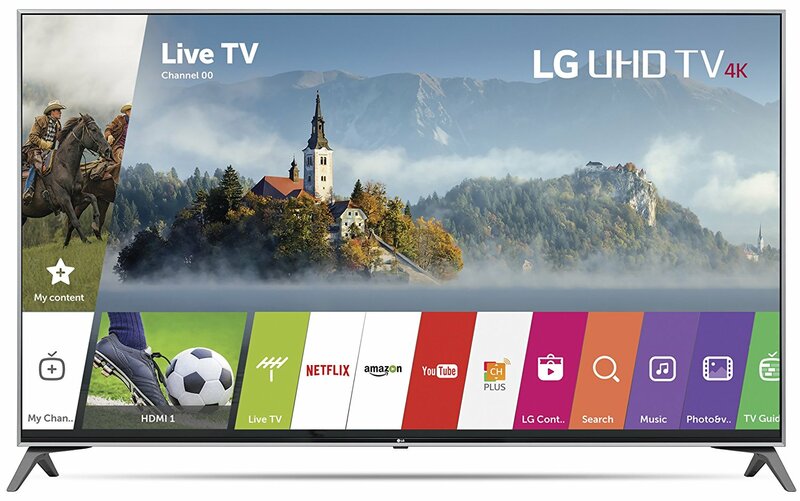 Two years ago a big complaint of ours was the poor streaming ability of LG's Smart TV platform. That's not the case this year thanks to the complete overhaul of the entire platform. This means the buffering times of streaming content are greatly reduced. Overall, the move to a WebOS based system was a good move on LG's part. The UJ7700 will make a fine gaming TV at around 30ms while tested in Game mode. While not nearly the fastest, gamers should notice little input lag from this TV. Sound quality is only average on the UJ7700 from the 20W sound system (2X 10W speakers). 35% volume level is plenty to fill a large room. Clear voice 2 was our favorite audio alternative. The UJ7700 has very nice clean lines and a small half inch bezel frame. The TVs depth is less than 2.4” and though the TV is not curved the attractive and well-made metallic silver convex stand is curved, which lends a nice artistic modern touch. It's a great looking TV. The UJ7700 is a really good deal since you get most of the best features of the higher end models. It's hard to beat from a value perspective and compares with similar 3rd tier LED 4K HDR models from Samsung and Sony. It offers tremendous value and will be a hot seller at these prices. The UJ7700 has all the bells and whistles needed to future proof for HDR, Dolby Vision, and 4K UHD content. The WebOS 3.5 system works great and the Magic Remote is always fun and easy. All this is enveloped in a sleek modern very attractive package. Medium quality black levels and contrast are drawbacks.